Archipelago Botanicals, best known for their bath, body and home fragrance products, has launched their first two personal fragrances, Pomegranate and Grapefruit. 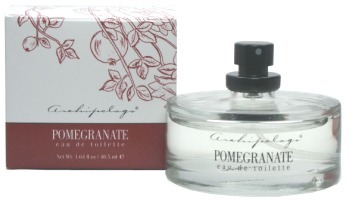 Archipelago Botanicals Pomegranate ~ "a fresh, lovely scent for everyday wear. Ripe pomegranates burst with sweet-tart fruits while blooming freesia and a hint of lemon keep it from becoming overly sweet or cloying. A crisp, bright, fresh take on a pomegranate fragrance." Archipelago Botanicals Grapefruit ~ "is simple and fresh. A sophisticated blend of grapefruit, vetiver and rosewood." For some reason these appeal to me, especially the grapefruit. I'm anxious to try the grapefruit as well – finding a good grapefruit scent is tough. Jo Malone's grapefruit is a little harsh on me – we'll see if Archipelago is a bit less scorching. How are you? We're having tons of rain, which is actually good since we'd come perilously close to skating directly into 80 degree days (typical in the Midwest). Bad for the spring flowers. I just received the Pomegranate bath and body products for my B-Day and I'm loving them! I will have to get the fragrance now! It does smell a little lemony to me now but it's not as fruity as I expected and since I am not a fruity person it works. Mamabear, yesterday was a perfect spring day and today we had this grey sky like a duvet that won't move aside for some reason.. Very soon we will be cooking again in this ancient city where we have no airco and hardly any wind for a breeze. Is it good to live in the Midwest? Where do you buy your perfumes, which city I mean? I never get bored of grapefruit but do not want it on my skin too often. Thanks Tara — I'll look around for the Pomegranate, if it isn't too sweet-fruity, I might like it too. MW, they do sound appealing, although would love to see a longer description of the Grapefruit. It's now bright blue skies and sunshine – typical Midwest. It could be storming again in an hour or so. I live near Chicago, buy most of my offline frags there or in San Francisco,.. The Midwest has a lot of good things to offer but it's not my favorite part of the country – the Bay area is. I like the coolness of a grapefruit /citrus scent in the scorching heat but have never found the perfect grapefruit. For cooler spring days I have been layering Fendi Theorema with Acqua de Parma Arancia. Works well for me, the AdP gives a little sparkly boost to the warmth of the Theorema. It'll be exciting to see where next you reside, yes? I wouldn't mind to go back to the Netherlands. It would be nice to have more tranquility in life. We'll see. Do you like the grapefruit of Un Jardin Sur Le Nil? I do especially with the incense in the basenotes. Robin yes but grapefruit with vetiver and rosewood does not sound like 'one of so many' but indeed no good description there. I like the sound of the pomegranate, lots. Grapefuits I prefer in me rather than on me. BTW would you be able to recomend a violet scent that has pretty strong leather and/or tobacco notes? A sort of violets as hells angels kinda thing. Oh and the clip that wouldn't play was parodying celeb scents and that Amy Winehouse should have one called Eau de Skank. It honestly was much better than my description! Wow Mamab. just looked at your website and you're really into hardware and stuff…what a nice contrast/combination with perfumes I love that. Ing.Kitten I know you are asking Robin, but one scent immediately popped up in my mind with violette and cedar: Bois de Violette by Serge Lutens, but not sure abt hells angels thing though. IngestedKitten: violets as hells angels is not calling much to mind right now. CB I Hate Perfume Violet Empire does have some leather, but wouldn't call it strong. Will have to think some more. I shall go find me a sample of that one. Hmm, this is what happens when I try to catch up on old reading here — another Grapefruit scent calling out to me. Reasonable price and I like the packaging. I think I'll buy the new CdG first, though. Are you buying the CdG grapefruit? Do report back! I won't order it from France or Europe now, but I'm looking into pre-ordering from a shop in Seattle, or else as soon as it's available anywhere else. I'll definitely let you know how it is. This perfumania is getting bad…. I really overspent my April budget because of too many “buys I couldn't pass up” (i.e., 30ml of Rose Poivree for $15 + shipping). Wow, that is a buy I couldn't pass up either, congrats!